A MAN WHO was arrested on suspicion of possession of a Class A drug with intent to supply by PSNI officers investigating the deaths of three teenagers at a St Patrick’s Day disco in Cookstown has been “de-arrested”. However, he remains in custody on suspicion of manslaughter in relation to the deaths of 17-year-old Lauren Bullock, 16-year-old Connor Currie and 17-year-old Morgan Barnard. 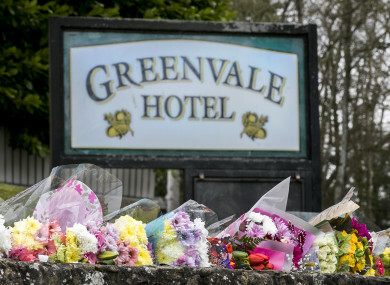 The teens were killed in the incident outside the Greenvale Hotel in Cookstown, Tyrone on Sunday night. Detectives conducted a search of a house in Moneymore at the time and seized a number of items. The 52-year-old man who was arrested yesterday was then further arrested on suspicion of possession of a Class A drug with intent to supply. In a statement, PSNI Assistant Chief Constable Mark Hamilton explained: “As a consequence of the arrest of a person on suspicion of manslaughter a search was carried out at the home of the suspect. The search discovered a medium size clear polythene bag containing an amount of a white powdery substance and pieces of tin foil. In line with normal procedure, he said, the suspect was arrested on suspicion of possession of a Class A drug with intent to supply. “This arrest was communicated to the media in line with procedure,” he said. “Given the gravity of the investigation the examination of the bag was carried out urgently,” Hamilton said. However, once opened by the Forensic Science Agency for Northern Ireland “the substance inside the bag was ascertained to be an innocent substance”. “The suspect was then de-arrested in respect of the drugs offence and a communication made to the media,” Hamilton said. The PSNI would like to make it clear that there is no suspicion of any crime relating to misuse of drugs on behalf of the person who still remains in custody. “We will continue to carry out a rigorous investigation into the circumstances surrounding the deaths of these three young people and we are deeply grateful for the huge assistance we are receiving from the community and we hope that people will continue to come forward and assist us with this enquiry,” Hamilton said. Parents are being urged to talk to their children and encourage them to come forward to tell their stories to police so they can “get an accurate picture of events that night”. Email “Man 'de-arrested' after suspicions of Class A drug possession over Cookstown disco deaths ”. Feedback on “Man 'de-arrested' after suspicions of Class A drug possession over Cookstown disco deaths ”.